"The Invention of Butterflies" is a 30-by-30-inch wall assemblage. Mia Kaplan's work will be displayed inside River Gallery through this month. Her sculpture in the Bluff View Art District's Sculpture Garden will remain through May 2017. Where: River Gallery, 400 E. Second St. 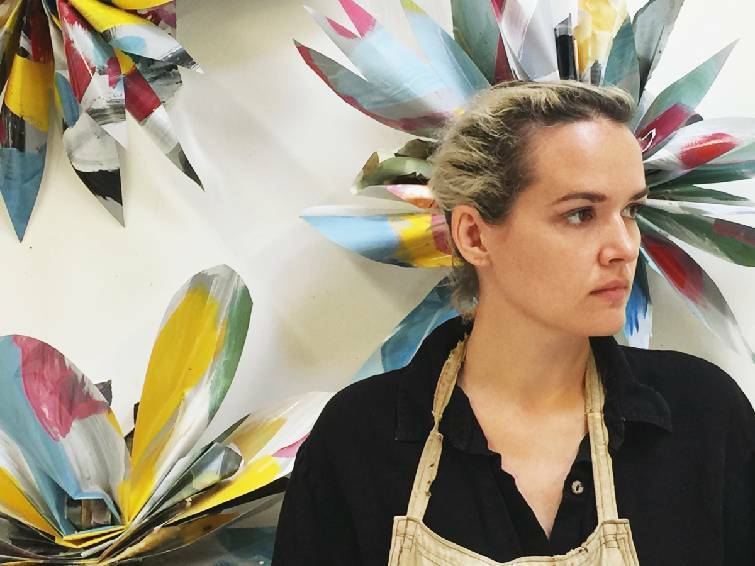 Artist Mia Kaplan is offering two perspectives in her new Inside/Out exhibit. 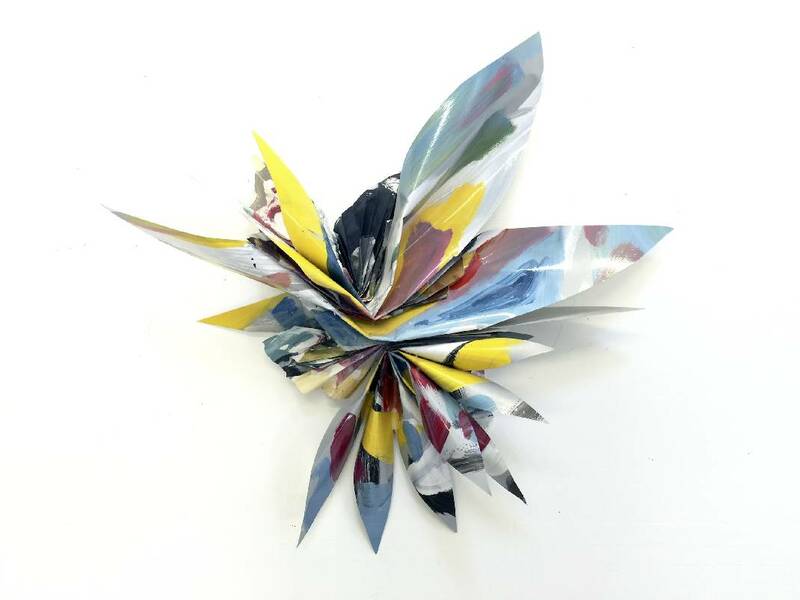 Showing at River Gallery, she is exhibiting abstract botanicals, mixed-media paintings and wall assemblages inside. Outside in the Sculpture Garden, she has two, six-foot, concrete-and-steel sculptures that she painted onsite on Wednesday, inspired by the colors of the Tennessee River and the garden surrounding her. Angie Supan, River Gallery assistant director, believes Kaplan's work will appeal to visitors because of the textures and color. For example, she says, anyone visiting the two outdoor sculptures will "recognize the color palette from what's blooming in the garden right now." The work of Kaplan, who's from Southeast Louisiana, has always been stimulated by the sights and scents of New Orleans. "I'm a painter who loves the swamps, camouflage culture, hot sauce, entertaining and being outdoors," she describes on her website. But it wasn't until the aftermath of Hurricane Katrina that she found that botanicals were her way to cope with the destruction in her hometown. Documenting the plants and their life cycles in the place where she grew up became her therapy. "My family decided not to evacuate and was there during the storm," she says. "My mother's house got five feet of water. She had to completely redo the bottom of the house and there was a lot of trauma associated in redoing the house. I don't have a lot of souvenirs from my childhood. "I noticed the only thing about my childhood home that was the same were the plants. I've found solace and peace in documenting the wild areas where I lived." Even so, Kaplan considers herself more fortunate than many of her neighbors. "I get to stand on the same slab where my house was, but it looks completely different. Some people's homes completely floated away," she says. Her botanicals are not the expected leaves of green, however, but her interpretations. They are aluminum, paper and canvas assemblages painted with enamel. Kaplan says it was never her intention to become "a drawer of flowers or a botanist. However, there remains this desire within me to know the names of what is growing around me, to tell a story that is no longer my own. "I began by trying to paint what was familiar to me as a child who spent a lot of time in the woods, and now I want to go further."